In Rotageek, 'Other' refers to anything that is not Annual Leave or Sick Leave. Typically this can include; Lieu Day's, Birthday Day's Off, Paternity/Maternity Leave, Compassionate Leave or anything tailored specifically to your business. 'Other' Leave can all be managed and edited via Leave Admin (just like Annual Leave) if it is marked as Requestable Leave. Requestable Leave can be requested by employee's and needs Managers authorisation/approval in Leave Admin. 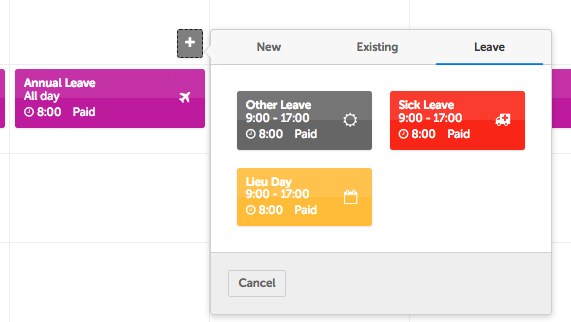 If the leave is Non-Requestable then it can be added immediately via the Scheduler through the Leave tab. This is one way of marking someone as sick, the other way is to click on a shift and tick the 'Mark as Sick' box if it has been enabled for your company. Maternity/Paternity will be managed via the Scheduler or Leave Admin depending on whether it is Requestable or Non-Requestable. If it is Requestable it needs to be added via Leave Admin. When adding the leave make sure to set the date range to the full amount of time they are taking off and set the 'Hours taken' to zero. If you're unsure on how to add Leave via Leave Admin, this article will help you. Rotageek will track each leave type for you so you're able to run a report and see how many days of each leave have been taken per employee. Find out how to create reports here.